Ryu Murakami, along with Haruki Murakami (no relation), is one of the best-selling writers in Japan and a major figure in contemporary popular culture. Since publishing his first work, Almost Transparent Blue, which won Japan's most coveted literary prize in 1976, Ryu has produced a steady stream of novels, stories, and essays that consistently astound and delight readers with their wild flights of imagination, irreverent humor, and brilliant, convincing portraits of some of the quirkiest characters in Japanese literature. 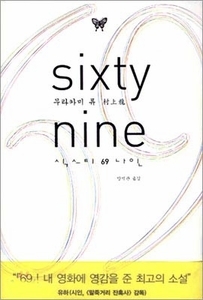 69 is a roman a clef about coming of age during a time that left its mark on baby boomers around the world--a time when we really believed we could change the world before it changed us. By turns hilarious, cynical, frivolous, and poignant, the book is infused from start to finish with Ryu's relentless energy and optimism; it simply refuses to get tedious, preachy, or "literary" for a single moment. The book is composed of the following: "Arthur Rimbaud," "Iron Butterfly," "Lady Jane," "Daniel Cohn-Bendit," "Claudia Cardinale," "Power to the Imagination," "Just Like a Woman," "Alain Delon," "Lyndon Johnson," "Cheap Thrills," "Amore Romantico," "Wes Montgomery," "Led Zeppelin," "April Come She Will," "Velvet Underground," and "It's a Beautiful Day."